If you’re in need of storage and unsure of where to begin to put something – look for “dead spaces” in your home. Whether that’s under a staircase, on the side of your closet, etc. and remember to look UP. Sometimes my favorite storage solution involves stacking things (safely, of course). I prefer storage solutions that serve double duty. 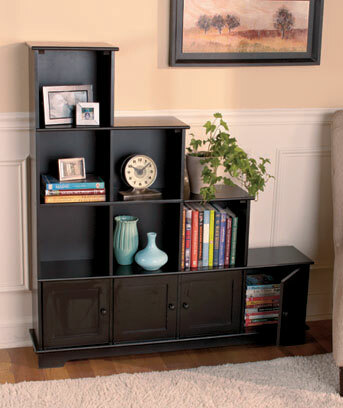 While the bookcase / shelf above allows for storage and displaying of books, CDs, etc. it also serves as a beautiful place to showcase photos, art, pottery or small plants. Emily on Let’s Go Cards!